Slow cooking is a great method of cooking when you want a hot, delicious dinner without a lot of work. Preparation time is minimal and it allows you to go about your daily business while your dinner is cooking. Lamb is a nutritional meat, high in zinc and iron. It also has a good amount of protein and is relatively low in calories and fat, though it is a red meat. 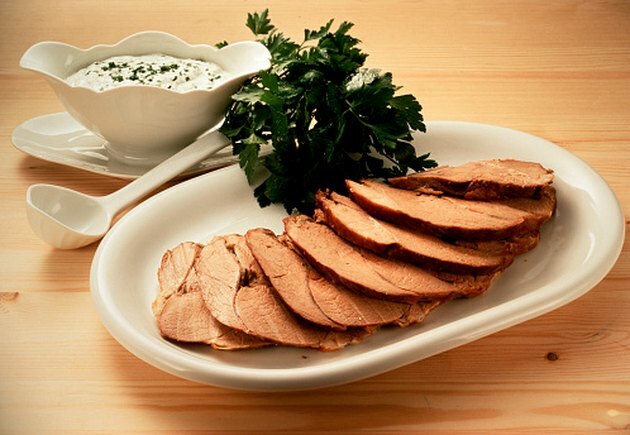 Lamb is high in B vitamins and a great source of carnitine, an amino acid needed for energy. Roasting a leg of lamb in a slow cooker results in a moist, tender piece of meat. It can be served alongside potatoes, rice, pasta or vegetables. Preheat a cast iron skillet with 2 tbsp. olive oil over medium heat. Brown the lamb on all sides, using tongs, for approximately five or six minutes. Slice the onion, cut the celery into chunks and place them on the bottom of the slow cooker. Pour the white wine and 1 cup of the vegetable stock over the vegetables. Evenly sprinkle half of the minced garlic and half of the rosemary into the liquid. Put the lamb into the slow cooker on top of the vegetables and pour the rest of the vegetable stock over the top of the lamb. Sprinkle the lamb with the rest of the garlic and rosemary. Cover and cook on high for three to four hours, until the internal temperature of the lamb reaches 145 degrees F.
Leftover lamb can be frozen for up to two or three months or refrigerated for three to four days. Use red wine as a substitute for white wine. Place chunks of potatoes on the bottom of the slow cooker, instead of vegetables. Purdue Agriculture Animal Sciences: Lamb: Good for You! What to Do With Tough Leftover Roast Beef?